For the 7th consecutive year, Music & Wellness will be blissfully joined together at the Soulsational Festival. The free community event will take place at Veterans Park in Bayville, NJ on July 29, 2017, 11am-8pm. Come and enjoy live music, a silent auction, giveaways, and meet local health and wellness businesses and practitioners. Lots of opportunities to give back and unite the Jersey Shore community! It is being sponsored and organized by Alternative Health Solutions of NJ and www.MichelleALeonard.com. This year is sponsored by Berkeley Township Recreation, The Zen Den, Shore Pointe Chiropractic, Weather NJ, and Glen Kelly Real Estate. We still have room to add more sponsors this year. 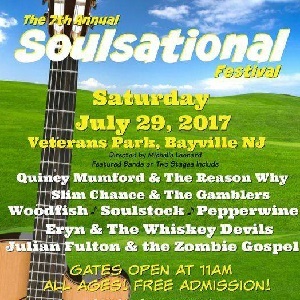 The Soulsational Music & Wellness Festival was created to honor, share, and explore the many healing modalities, practitioners, organizations, and businesses devoted to health and wellness at the Jersey Shore. Its goal is to increase awareness of the many different green, holistic, organic, and healthy options within our community, support the local economy and offer a unique interactive family experience for all those in attendance. Together, we hope to motivate and inspire our community by finding what brings them health and greater happiness while creating lifelong memories. The festival is expected to reach an audience of over 5,000 people with continuous dual stage entertainment including great local original New Jersey musicians, numerous free group classes, A kids village, an art gallery, poets corner and live demonstrations. The day is packed with a full schedule of events for the entire family of all ages. Over 150 vendors including LAWKI, Anchorage Spine & Physical Therapy, The Vitamin Shoppe, Hannah Mary, Rock Steady Boxing at Apache Crossfit, Keep Me Safe Organics, and Ocean Organics. There will be food trucks to visit, a Kids Village, interactive exhibits, healthy food options, organic beer and numerous planned activities- there is something for everyone! LIVE MUSIC from Area Artists! There are still some opportunities available for businesses to be a part of the festival, including sponsorship, exhibitor spaces, crafters, a place for one-on-one work, and group practices. It’s all about “Locals Loving Locals” and motivating and inspiring health, hope, happiness, and harmony. Soulsational Music and Wellness Festival will directly support the education and awareness of living an optimal wellness lifestyle, healthier living options, and spreading the Live Positive Today Movement. This is a volunteer run event and we charge no admission fees. We are asking for donations of pantry food, diapers, socks underwear, school supplies and new toys. We will give all donations from this event to local Ocean and Monmouth County charities. Learn more about Michelle Leonard. Alternative Health Solution of NJ’s © nonprofit mission (with a pending 501C3) is to enhance the positive quality and development of individual, family, and community life by providing services that are available, accessible, and responsive to the needs of those seeking assistance, and to work with the community to educate, contribute, facilitate, and promote solutions for the enrichment of all. Connecting people, enriching lives.